Ms. Lin's studio, A Touch of Opera, held a concert on Nov. 12 at the Good Samaritan Episcopal Church, inviting the San Diego Chinese Choral Society to perform two songs, 星月交輝 (The Moon and Stars Shining Bright), and 龍的傳人 (Descendants of the Dragon). Also featured were Ms. Yeoun Ug Yap, one of Ms. Lin's alumni students from Maui, as well as Weiping Wang on dulcimer and Xiaonan Zhang on erhu. News article at the San Diego Chinese Press website. Picture gallery here. Videos and picture gallery at the Five Continents and Four Oceans website. The San Diego Chinese Choral Society participated in a performance for the We Chinese in America publication on 5/15 at the Poway Center for the Performing Arts, together with Dr. Weiping Wang playing the dulcimer. There is a picture of our performance at the Five Continents and Four Oceans website here, and videos here and here. A very brief clip is also available from the CCTV broadcast here (starting at 2:51 seconds). 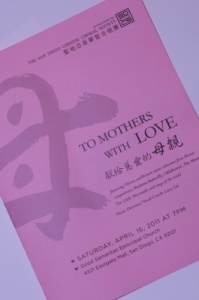 The San Diego Chinese Choral Society held a concert on Saturday, 4/16 at the Good Samaritan Episcopal Church in early observance of Mother's Day. 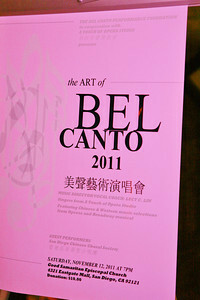 In addition to vocal selections from Mozart, classical Chinese composers, contemporary Broadway and movie themes and music from around the world, this performance also showcased the talents of Brian Sumwalt (percussion), Dr. Weiping Wang (dulcimer), Dr. Xiaonan Zhang (erhu) and Tracie Yang (flute). Members: The next rehearsal will be on Thursday, Apr. 28 -- no rehearsal on Thurs. Apr. 21. Concert and rehearsal photographs by Alan Su Photography. Click on the small images to view as large pictures. Mouseover the large pictures for additional options. 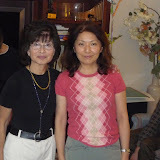 News article, pictures and videos at the San Diego Chinese Press website. News article and videos at the Five Continents and Four Oceans website. 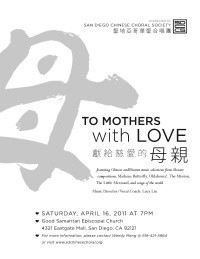 The San Diego Chinese Choral Society will hold a performance, titled "To Mothers with Love," at 7 PM on Saturday, April 16 at the Good Samaritan Episcopal Church (4321 Eastgate Mall, San Diego, CA 92121). For tickets, please call 619-421-5964, or email the webmaster. Suggested donation: $10/ticket. The Schedule page has also been updated with the remaining extra rehearsals leading up to the 4/16 concert. Pictures from the Oct. 24 after-concert party have been uploaded. This also doubled as a belated birthday party for our musical director, Ms. Lucy Lin.